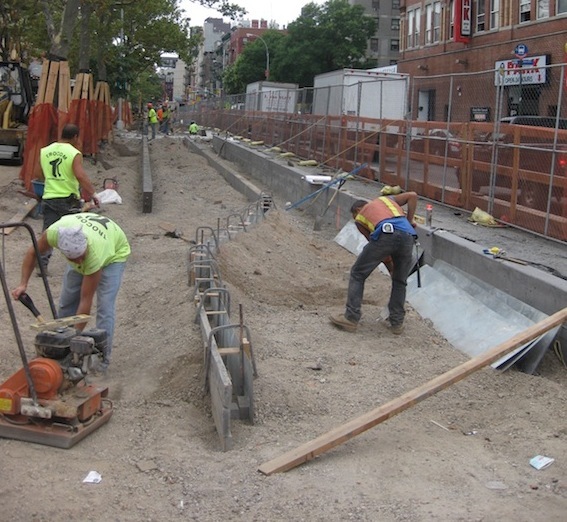 Crews are currently at work turning the new pedestrian plazas and protected bike lanes on Pike Street and Allen Street into more attractive, long-term fixtures of the Lower East Side. The new construction will add landscaping and higher-quality materials, helping the local community achieve the vision developed for Allen and Pike Streets in a multi-year grassroots process. After the first phase of this project was completed in 2009, traffic injuries dropped by 40 percent at the intersections with pedestrian plazas, according to NYC DOT. At the corner of Allen and Delancey, injuries dropped 57 percent. Work on upgrading the improvements with better materials began on the southernmost end of the corridor, on Pike between South and Madison Streets, in February. Right now, crews have dug up the median on the block of Allen between Hester and Grand Streets, with plans to work north to Delancey. Check below the fold for a rendering of what the new sections of Allen will look like once completed. Yeah bending in the bike lane at the intersection to cater to New Yorkers’ native instinct to stand right at the edge so we can prepare to jaywalk is an excellent design decision. Kudos to whomever incorporated that! This is a beautiful-looking project, and I’m very excited to see protected bike lane become permanent – no temporary materials here. I’m a little concerned, though, about people walking in the bike lanes. At present people often use the bike lanes to push large shopping carts and to walk in. It’s not a big deal since there is ample room to pass in the existing configuration (about 15′ of clear space). 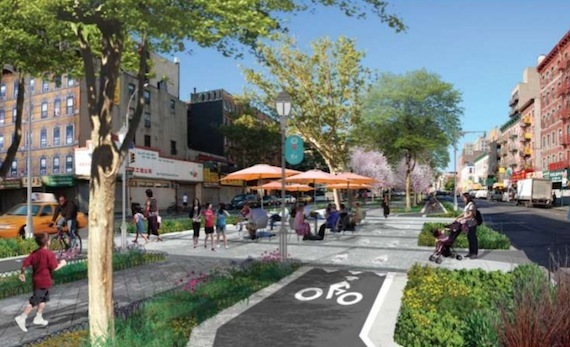 The design images show a 6′ bike lane with plantings immediately on either side, which looks like it will be pretty difficult to pass another bike, much less a large shopping cart. Also, what is the timeframe for these improvements? From what I’ve seen biking, there are 2 segments under construction. The section from South Street up to Madison got underway in January or February, while the section between Grand and Hester began in May. between south and cherry and between cherry and madison the bike lanes are already open, although the landscaping and all of the rest is still under construction. I ride this route every weekday and people are already strolling through the newly opened (and still just blacktop) bike lanes… despite the giant sign at each entrance which reads: “No Pedestrians”. I’m so happy these stretches are getting close to usable and I’ve already resigned myself to wrangling around pedestrians. People who don’t pay attention to the signs are really, *really* tedious, but even so dealing with them still beats having to ride in the traffic I’ve been riding in for a number of months now. The existing bike lane on Allen Street, a bollard protected lane on either side of the median, is highly functional. It is wide and free of vehicles and mostly free of pedestrians. I would like to see time and money spent to expand the network of protected bike lanes ahead of beautifying existing protected bike lanes. I would rather have more protected bike lanes on streets that have none, rather than a prettier protected bike lane replacing an already functional one. In addition, this design could be better. Bike lanes should be built with the idea of 10 times as many riders as there are at present because that is where NYC’s cycling growth will lead in a few years (hopefully!). This design is not wide enough for that. It looks like it will barely let a cyclist of one speed pass another. Also, it looks like it will set up conflicts between pedestrians/joggers and cyclists in a similar way to the Hudson River Greenway. On the west side Greenway there is a separate walkway for nearly the whole length from 70th Street down to Battery Park. Yet joggers use the bikeway instead and clog it up (despite all the white signs directing runners to use the walkway). The new Allen Street bike lane will be prettier but might be less functional since it will be narrower and could get clogged with joggers who feel entitled to use bike-only paths. viewed from the manhattan bridge, there are two lampposts in the middle of the bike path on the last block before south street. what’s up with that? Wow! Hardly a piece of heavy equipment in sight in that first picture but there are a lot of men working just as that PERI Study found. It so interesting seeing that reality manifested so well in a photograph! Are there stretches of the built-out Allen/Pike that are open already?? I usually check on the progress from the Manhattan bridge each day, but the detour has made this less possible. Looks good. I just hope not too many bubbies and poupous get run over by hipsters on their fixies. Thanks to everyone for the tips about the sections being open. I rode the new section (South to Madison) a few times recently, and I must say that I don’t think it’ll be too difficult for one cyclist to pass another, unless they plant heavy shrubbery or put fencing on the sides of the path (Fencing, walls, and other things along a path/lane/sidewalk you can collide with cause people to walk/bike/drive a certain distance away from them, known as the “shy distance”. This effectively reduces the width of the path/sidewalk). Also, satellite images on google maps for Manhattan has been updated for early 2011. You can see Allen/Pike, 1st/2nd Aves, Broadway, Columbus, etc. Very cool. The last round World Cup qualifier, Argentina 3-1 win over Paraguay, media in praise team super attack force at the same time, also criticized the defence. “Ole news pointed out that although Argentina win, but defence but exposed is insufficient, only the team offensive attack cover up the defect of the defence, the newspaper also assertion: Argentina defence if you can’t get improved, then the Wholesale Football Jerseys team will pay the price, because not all the team’s offensive like Paraguay so weak. The national news also said, Argentina fragile defence beyond imagination, they really need with a line to avoid the stability of the state of the team appeared again and again. Media fears are redundant to Peru’s game, Argentina attack encountered great difficult problem, and in the team offensive lose power, the shortage of the defence is amplified. Having, Argentina defence poor performance, with the national newspaper words, Argentina the right campania ROM and fernandez performance especially bad, they almost be opponent’s attack get dizzy, bite the bullet to insist on playing the game. On the left, on di Mary and ROM. Huo combination is difficult to satisfactory, they can’t stop method’s fan o and German kula attack. It was also in this area to make mistakes, resulting Customized football jerseys for cheap in Argentina is a penalty. The underdog team almost from midfield attack, di Mary’s French van foul, Argentina was a penalty,discount mlb jerseys fortunately romero facilities.at help Argentina goal not be rent asunder. But the underdog team insist on Argentina pressure, and Argentina defence also unbearable heavy burden, was soon Peru score. In fact, the whole game, the underdog team chance after chance. The 22nd minute, Ed library pull with the free kick on the right side of the cross, mulberry blah’s cheap football jerseys TongShe 8 yards left into the net, the attack is very beautiful, from midfield to the bottom line, and then to the area of the triangle fit to Argentina defence attend, Argentina goal and therefore fails. Argentina defence again face the test, 25 minutes, Ed library pull the right cross, cary ROM small before the volley that was campania ROM. Stop out of the fanli bottom line. 53 minutes, Peru’s free kick on the right cross, Argentina defense again chaos, pizarro tong preach, alberto rodriguez melee medium and small area on the right side of the shot was blocked by the legs romero. Argentina 54 minutes and escape, cary ROM the area before the power shot hit the post. The 72th minute, pizarro get close range header opportunity. The opposition has a so many chances, Argentina lost only one ball, is lucky. Argentina defender set off Peru player very well. O German Nike NFL Jerseys China card in the left free running, his fast run to Argentina side of the offensive and defensive almost paralysis. About markov, performance is very stable, he and the method’s fan together make Argentina defence scout. Method’s fan shows strong offensive ability, his speed and breakthrough ability to Argentina defender unable to parry. After the Brazilian media quip, today’s cheap nfl jerseys from china Argentina is like a bankrupt noble, front a galaxy of talents, the stars shine, is like the upper part of the body was wearing a magnificent furred robe, but the back but was full of ErSanLiu player, starlight is bleak, like the lower half Wholesale Nike NFL Jerseys China is wearing a broken shorts. This dress, in serenity, Argentina can play three boxing two feet, can beat opponents, such as 3-1 defeat of Paraguay, but if meet with wind and rain, will also have frozen trembling, such as this was Peru a 1-1 draw.